How it Works - How does Dropshirt Software Work? How Does The Drop Shipping Software Work? We believe that everybody should be able to become a t-shirt entrepreneur. And we also believe it should be easy to order drop shipped products with just the click of a mouse. That is why we created dropshirt.com.au. A place that connects your products to our production house. But, it's more than that. For a completely efficient process, our dashboard connects your t-shirt designs directly to a human operator at a t-shirt printing workstation. We believe we have created a place where everybody has access to a t-shirt fulfilment centre at wholesale prices. Like we said in the intro, the software works by "connecting the products in your store with our fulfilment centre". Our software is connected to your store by a commonly used piece of software called an API. (﻿Application Programming interface﻿) If you just read that wikipedia article, you probably fell asleep. We won't bore you with the details, but, it just means that our dashboard can talk to your shop. It is very secure because we both have the same key (API Key). The software works slightly different depending on the shopping cart software. Here is the basic idea. If you want us to drop ship a product, you just need to activate the software for that product. Then fill in a few fields with some extra information about your product. We call them "Custom Print Fields". When this is completed we call this product "Enabled". Pro Tip: You don't need to do anything until you have a sale for that product. 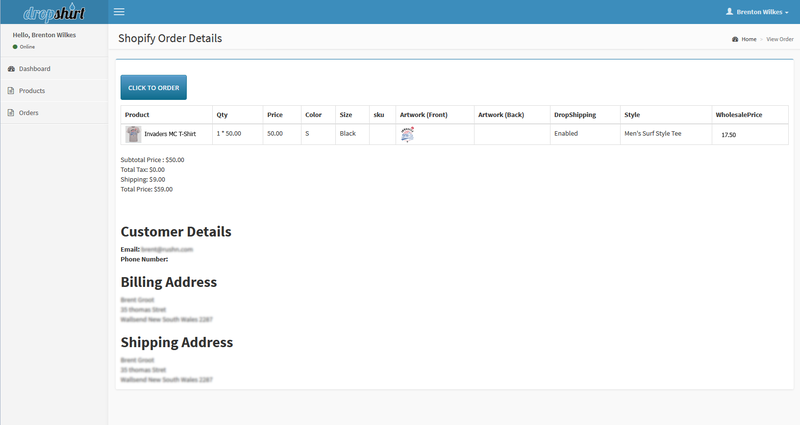 You could fill the "Custom Print Fields" after you get an order - if that suits you. What are Custom Print Fields? Custom Print Fields contain additional (...and private) information about your product so we can print your order. Things like the artwork file and the product you want it printed on. Here is what we need and why. What if I have an Existing Store? The software works if you have an existing store or a brand new store. Here is an example. If you have a website selling "Cat Furniture" and your want to start selling "Cat t-shirts". Simple. You only need to "Enable" products you want us to drop ship on your behalf. To get a good print result we need high resolution art files. A file resolution of between 150 - 300 DPI with the image at print sizes is acceptable. Your file MUST be submitted in .PNG format. The art board must be 14inches (35.56cm wide) x 16 inches (40.64 cm high), regardless of the size of the design. ﻿Read About Creating Artwork Files Here﻿﻿. Orders for "Enabled" products will show in your dashboard. To Order, simple click the Big Blue Button named "CLICK TO ORDER" You can track the process of the order right through to delivery. What do I Need to Start Selling T-Shirts? Do You Print in Australia? Yes, all orders are printed in Australia. We are backed by an Australian owned and based apparel company that ship orders from either their Melbourne or Brisbane print houses. ﻿Learn more about ﻿the s﻿hipping costs on this page﻿.